Where to Park Near Mt. Vernon Square in Washington, D.C. Parking spaces are plentiful near the Washington Convention Center. There are more than 3,000 parking spaces within a three block radius of Mt. Vernon Square. Traffic can be congested in this part of the city when there is a big event going on, but there's generally enough available parking to accommodate the crowds. This downtown Washington, D.C. neighborhood is also easily accessible by public transportation. 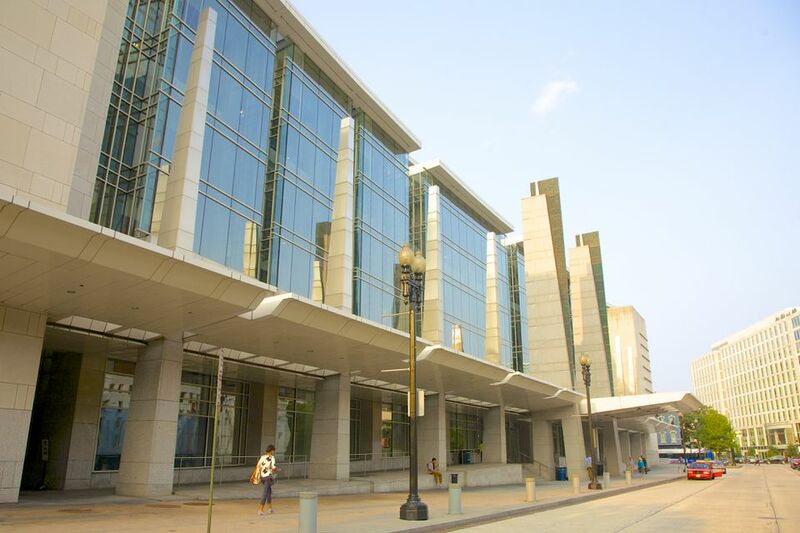 The Walter E. Washington Convention Center is located at 801 Mount Vernon Place (At 9th and 7th Sts. ), NW Washington, D.C. The closest Metro stop is Mt. Vernon Sq/7th St. Convention Center. Gallery Place is also within a walkable distance. Most parking garages and lots offer hourly and daily rates. They vary for each facility but range from $6 for one hour to $20 for the day. Special rates may apply for special events. See a map, directions and transit options. Center City Parking - 9th Street between New York Ave. and H Street NW Washington, D.C. (202) 265-0010. Interpark - Renaissance Hotel, 999 Ninth Street NW Washington, D.C. (202) 898-9000. PMI Parking - 915 Massachusetts Ave. NW Washington, D.C. (202) 785-9191. Quick Park - Grand Hyatt, 1000 H Street NW Washington, D.C. (202) 582-1234.
http://www.parkamerica.net/Park America - 700 11th Street NW Washington, D.C. (202) 789-1750. PMI Parking - 610 Mass. Ave. NW Washington, D.C. (202) 785-9191. Marc Parc - 500 K Street NW Washington, D.C. (202) 464-2900. Doggett – 701 8th Street NW Washington, D.C. (202) 393-2923. Colonial Parking at Gallery Place – 701 6th Street NW Washington, D.C. (202) 393-2923. Altmans Parking – 449 K Street NW Washington, D.C. (202) 337-1005. System Parking – 700 8th Street NW Washington, D.C. (202) 331-0980. Curbside drop-off is available for wheelchairs at each corner of the Convention Center. Automatic doors are located at the Mount Vernon Place, L Street and Metro (7th and M Streets) entrances. There are twelve metered public parking spaces designated for the handicapped and requiring the display of a disability parking permit or license tag. There is very limited street parking near the Washington Convention Center, but if you are lucky enough to find a space, be sure to read the signs and be aware of time limitations. Most on-street parking spaces are limited to two hours. Rates are $2 per hour in the busiest areas of the city. All meters in the city are enforced on Saturdays, as well as evening hours Monday through Friday. Most meters no longer require quarters. Pay by Phone is available through Parkmobile and solar-powered single space meters take credit card payment. Street parking is free with unlimited hours on Sundays. The area near the Convention Center is especially busy on the weekends, so your best bet to find a space is to arrive very early.